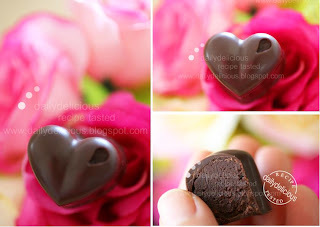 I start to love this kind of thing, little chocolate bonbon, is my new toy. Anyway I can't say that I'm good at it, it's only the beginning. Last year my friend gave me the silicone chocolate molds (well about 3 of it) after I said that I want to try it. I use the plastic one before (Chicken Farm Bakers' Project #6: White Chocolate with White Chocolate Caramel Ganache and Macadamia Nut) but she told me that the silicone mold is very good too. But I just forgot about them, until now, haha, I saw the recipe for the Bonbons chocolat framboise from the book: 洋菓子の基本―パティシエの仕事 基礎から分かるお菓子づくり (Understanding how to make Basic patisserie with illustration ) by 高木 康政 (Yasumasa Takagi), I thought that I should try this one. Because when thinking about the contrast flavor of the raspberry and the chocolate, well, it's delicious. Anyway, I had to make two batch of this bonbon, first is the one that I took the how to pictures, and the second one is the one in heart shape that I took the finished product picture. Because I never use the silicone chocolate mold before, I got some problems, first the mold seen to be too soft and when pour the chocolate into the molds there are a lot of air bubble and it's hard to turn it up side down on the chocolate bowl too. My first batch is very ugly, >*<, the surface is not smooth and my table is very, very dirty too. Luckily, the filling is enough for me to try it again (well it's easily to make in this amount, if the ingredients are too little, you just can't boil it properly), so the next day, I make it again. But this time I don't let the same kind of problem happen again (haha, or I can say that I try not to make the same mistake). I start by select the small baking pan about the same size as the mold, because when pour the chocolate into the mold to make the outside of the bonbon, you have to tap the mold to smooth the chocolate (the air that trap inside will be out), and place the mold on the pan will make it easier, cause you just tap the pan (with the mold on it) no problem with the softness of the silicone. Next one is the problem when you turn the mold upside down, you have to remember that the mold is very soft so place some ruler on the chocolate bowl, so when turn the mold to release the chocolate it will be safe (my first batch I just drop the mold into the chocolate bowl, haha). So, after I solve all my silly problems, ^ ^ I can do it! 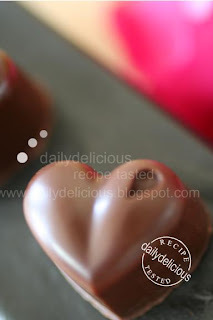 And using the silicone mold is very easy, it's easier to take the chocolate out of the mold and easier to wash too. This bonbon is very good the sourness from the raspberry contrast to the bitterness from the dark chocolate. You can choose the percentage of the chocolate that you want to use, it's will change the flavor of the bonbons, so go darker if you love it. 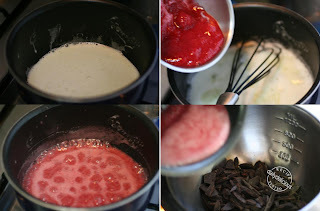 Put the whipping cream, raspberry puree, glucose syrup in a small pan, bring to boil. 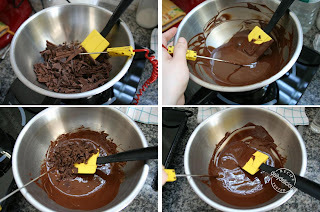 Pour the hot mixture over the chocolate and stir until the chocolate melt. Put the butter into the ganache, and stir to combine. Divide the chocolate into 2 part, 160g and 40 g.
Put the 160g chocolate into the bowl, then place the bowl over the simmering water. 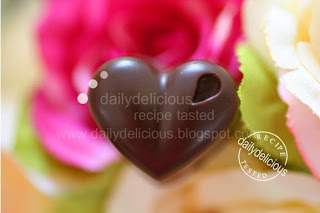 Heat the chocolate until the temperature reach 50°C, then take the bowl out of the heat. 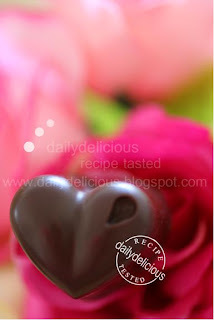 Pour the 40 g chocolate into the melted chocolate, stir until the temperature drop to 27°C. Place the bowl over the simmering water, again heat until the temperature reach 31-32°C. The chocolate is now ready to use (if the chocolate cooler, heat it again but don't let the temperature higher than 32°C). 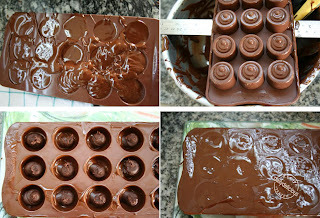 Pour the chocolate into the mold, rotate to cover all the molds. Tap the mold to release the air that trapped inside. Turn the mold upside down, to release the chocolate. Let the chocolate cool, (you can put the mold in the refrigerator for 20 minutes to speed up the process). When the chocolate is harden pipe the raspberry ganache into the chocolate. Cover with another layer of the chocolate. Then let the chocolate cool, (you can put the mold in the refrigerator for 20 minutes to speed up the process). Softly push the mold, the chocolate is now ready to serve. I don't think it will be good because the jam has more sugar and the ganache can be too sweet. If your raspberry is very sour, add sugar will be great, use about 10-15% of the raspberry weight. Can I know why you add liquid glucose in the ganache ? It will help thicken the ganache that made from fruit puree. Can you substitute glucose for honey or regular sugar? You can use honey instead of glucose.